I’m always looking for non invasive ways of tightening and improving skin. I have therefore happily spent the last few months trying some new (to me) skin tightening treatments. It’s been a manic year and I was feeling a bit worn out which never bodes well for your skin. What could be better than having a little skin rejuvenation? As ever with these radio frequency treatments, the results are subtle but completely natural and do make a definite difference. It’s important to remember however, that this is not a magic fix and is completely different to any kind of surgery where the skin is pulled tight. I tried two different treatments. One for my face beginning underneath the eyes and going down to the neck and another for the eye area. This can be done all over the face but I used this for the eye area. It has a small wand that is perfect for the size of the eye. The idea is to refresh the area round the eye, reduce the appearance of wrinkles and tighten the skin. It does this by heating the deep layers of your skin using advanced radio frequency. This causes the existing collagen to contract and tighten while also causing your skin to produce new collagen. The great thing is there are no needles involved, no pain and no downtime. A conductive gel is applied and the the wand is smoothed back and forth over the area. It gets quite hot but discomfort is held at bay by the constant movement. If it gets too hot, the therapist can easily turn it down. It makes quite a loud beeping noise which I soon forget about and usually nod off. Some people may get a little redness or even mild swelling which should disappear within 24 hours. I myself didn’t get any of that. There is an instant effect of tightening but it takes about a month or so for the new collagen to grow. As time goes on the effect gets better and better. The therapist will suggest how many treatments you should have but it’s well worth even having one. Normally people will start with about 3 treatments spaced about a month apart which is what I did. I fully intend to continue the treatments to keep up the very good result. The part of my face that needs the most tightening is the jawline. Fractura Firm uses a stumpy flat-surfaced paddle that is just perfect for smoothing over this area. It feels rather like having your face ironed which can only be a good thing! It’s not suitable for the eye area and can be a bit uncomfortable on the forehead so we kept to the area beneath the eyes and concentrated on the jawline and the upper part of the neck. 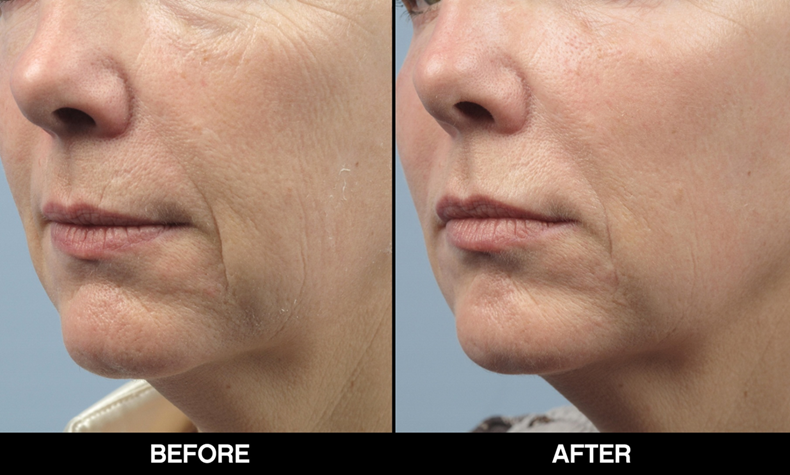 It too is an advanced radio frequency treatment that stimulates new collagen growth. 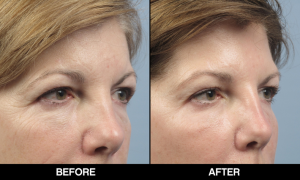 It’s completely non-invasive and once again uses heat to make the collagen contract. It improves skin texture and tightens loose skin, giving the appearance of a gentle lift. Although it can be used all over the face, I think it’s particularly good for jowls and neck. It can also be used on the arms (bingo wings) and abdomen. It’s best to go for a 6-8 week course of weekly sessions. I loved this treatment and will continue with it on a regular basis, time allowing. Although the results for both of these treatments may seem quite subtle, it’s my belief that these treatments start by initially firming and improving the texture and elasticity of the skin, and then slow down further decline of the skin as it ages. This is no mean feat in my opinion. I’ve been doing these type of treatments for about 4 years now and I believe that my skin has not aged a great deal in that time. People I know who have opted for facelift surgery, find that although the result is a dramatic tightening, after about 5 years their skin rapidly starts loosening and ageing again and after 10 years it’s like they never had a lift. I’m much more inclined toward a treatment that carries none of the risks of surgery, has no downtime and by boosting collagen levels, slows down the ageing of the skin. The treatments are not cheap unfortunately and a series of treatments will set you back a bit. However, I think even a single treatment is well worth it. I did both the Pelleve and the Fractura Firm at The Harley Street Skin Clinic which is a real find. They do absolutely everything there, from surgery to facials. It’s welcoming and cosy and feels like you’ve gone to have tea with a friend. In fact they’ve got tea with lovely vintage teacups and biscuits all set up in the waiting area. How about that right in the middle of Harley Street? Hello, These photos look most impressive. My problem area is around my mouth, especially just above the top lip. The lines are deep and I hate them!! I don’t like the idea of Botox but I guess this is the only answer? Thank you. Some people will use a bit of filler in the top lip and the area above but I think the filler really shows, specially from the side view. However it will smooth it out. It’s a tricky area to treat but the Fracture Firm will do some subtle smoothing on the area around the mouth.